New York City-based artist Arturo Herrera's dynamic, Disneyesque abstractions traffic in the associative realm between the conscious and unconscious mind. Herrera's Hammer Project will include a new all drawing, paintings, and cut-paper and felt pieces. Residing on the cusp of the perceived and the imagined, Herrera's abstract paintings bring a range of referents and narrative scenarios to mind. They refuse to coalesce into distinctly legible images but instead remain provocatively open-ended and suggestive. Arturo Herrera was born in 1959 in Caracas, Venezuela. He received a B.F.A. from the University of Tulsa in 1982 and an M.F.A. from the University of Illinois, Chicago, in 1992. In the United States, he has had solo exhibitions at P.S.1 Contemporary Art Center and Brent Sikkema in New York, ArtPace in San Antonio, the Art Institute of Chicago, and the Rennaissance Society at The University of Chicago. Internationally, his work has been shown at Centre d'Art Contemporain in Geneva, Zeno X in Antwerp, the Instanbul Biennial, and the Wϋrttembergischer Kunstverein in Stuttgart. He is represented by Brent Sikkema, New York. Pluto (1998-2000) is a small, white cast-gesso head that protrudes from a pristine gallery wall at about the height at which a label might be placed. Only the stylized cartoon head emerges. Its neck is flush with the surrounding surface, and the grainy texture of the plaster differs only slightly from that of the surrounding wall. On the other side of the wall, in the same position, is an amorphous cavity that is just the right size for a person's hand to slip inside unnoticed. Its edges are smooth and flush with the wall. This cavity is the void within Pluto's body, the absence of form that allows form to take shape on the other side. Like all of Arturo Herrera's sculptures, collages, fiberboard paintings, wall paintings, his rare photographic endeavors, and his recent cut-felt works, Pluto is an enigma, a sensually seductive entity, suggestive of childhood memories and fantasies. It is the result of a clear agency, bordering on the violent, a gaze able to look at a space and imagine it to be a malleable, liquid material that can be bent and morphed at will. 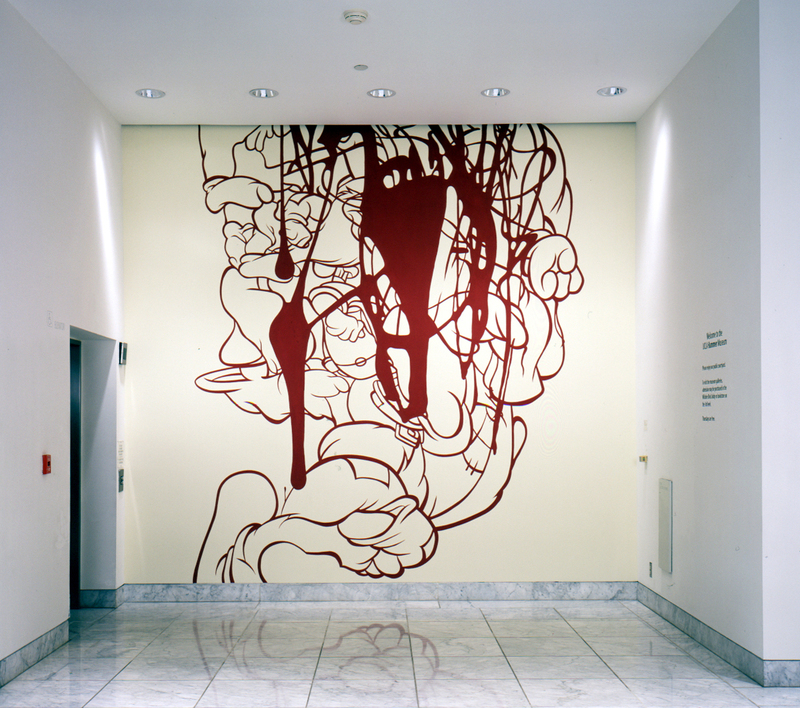 Herrera has inserted plaster casts of Pluto, Geppetto, and the Holy Family into walls on various occasions since 1998, most notably at the Renaissance Society at the University of Chicago in that year and in the exhibition Greater New York at P.S.1 Contemporary Art Center in early 2000. There is no conceptual method to this associative process, which recalls surrealist and lyrical abstraction and reaches back through the appropriation art of the 1980s and the pop art of the late 1950s and 1960s to cubist collage at the beginning of the century. 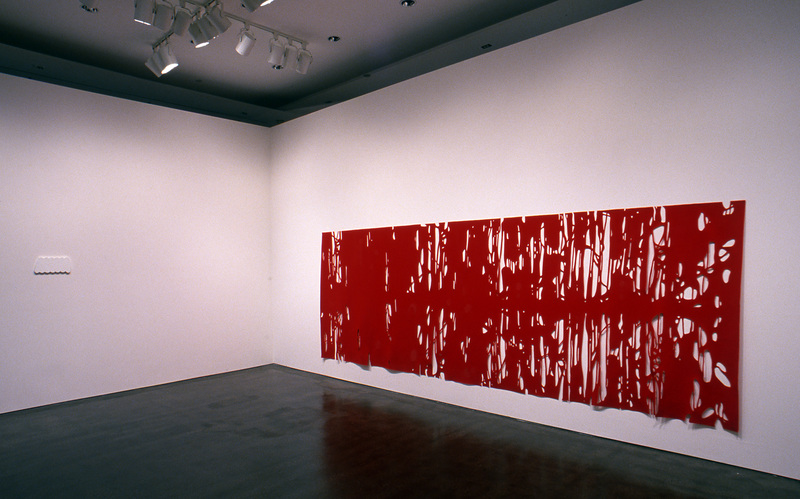 In some ways, Herrera's oeuvre explores the potential he feels is still present in modernist practice - that an image can be created by a subject as the expression of an "inner self" intuitively arranging form and color, that it can be based on an experimental approach to materials, and that can be novel and relevant. Like his early collages, Herrera's wall paintings made with household latex paint also combine high and low culture: modernist abstraction and vernacular imagery. They reach a balance where the viewer is drawn in by the desirable colors; the rhythmic, repetitive, ornamental dance of forms; and by obsessions and fantasies onto these ambivalent zones where full-blown narrative seems always imminent, just a breath away. A seamless, hard-edged look imbues these works. 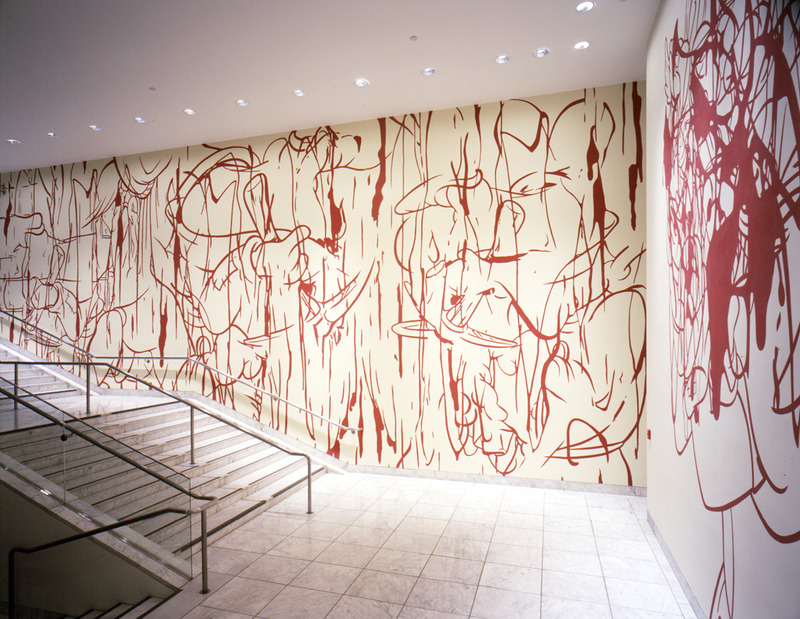 Herrera's first wall painting was made for an outdoor billboard in Chicago in 1994, followed by the orange indoor Tale (1995) at Randolph Street Gallery in Chicago, and by the outdoor black contour-lined and overtly sexual Out of Twenty-four (Museum of Contemporary Art, Chicago, 1995). Herrera has made an increasing number of wall paintings since 1998 (Three Hundred Nights, Forty Winks, All I Ask, A Drop to Drink, Two Mornings). Just as his collages are about the mechanisms of projection and interpretation, his wall paintings stem from questions of how people project onto and interpret architectural spaces rather than from any preconceived content or design. 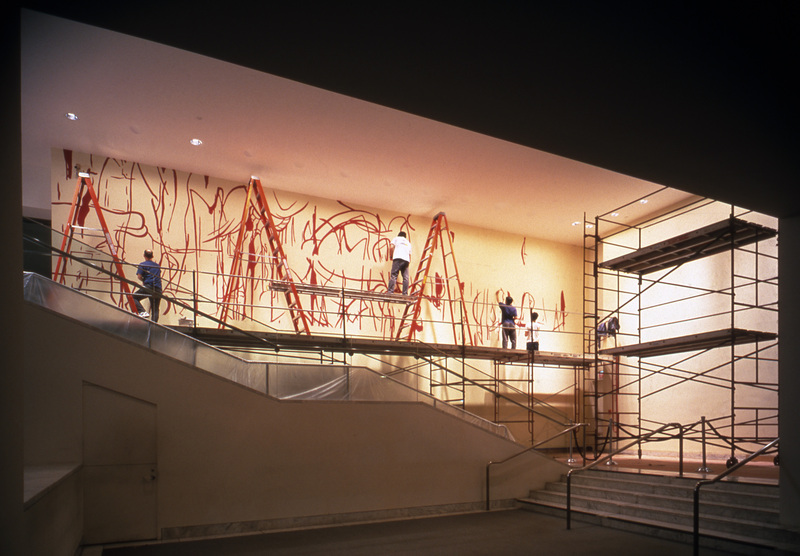 In his recent ceiling painting for P.S.1, Party for Tom (2000), a playful, colorful shape that recalls the paw of an animal appears to penetrate the stairwell of the old school building from outside and to be held there suspended by ropes. In this work, which is fleetingly experienced by viewers as they ascend or descend the stairs, pop elements become more surrealistic, and minimalist elements become more playful. All of Herrera's works seem to revolve around channeling and challenging the viewer into personal interpretive endeavors. The amorphous brown from that appears to envelop the paw shape in Party for Tom might suggest the nourishment and pleasure of chocolate or, on a different note, feces. The closer the associations are to the body and to childhood memories, the more violent and free the interpretive projections become. Among Herrera's most sensual works to date are his recent cut-felt wall pieces, which he began to create in 1998 after a few earlier experiments. While working in his studio on the rendering of "dripping" in a small collage, the artist decided to create a work that would at once dwarf the viewer and enhance the tactile aspect of the drip, thereby suggesting the experience of the sublime. Felt offered just that possibility. It is material that can easily be cut with an X-acto knife, and like the paper collages, it leaves no threads hanging. He could use felt the size of a blanket to create a version of painterly drip paintings that would hang on the wall, suggestive of high modernism and the sublime romanticism of some abstract expressionism, while at the same time distancing itself from that project. The perfectly incised and cut red, blue, brown, or black works are paintings without paint, emblematic markers of high art, but despite their tactility and the intensity of their color, they always and inevitably droop slightly at the bottom, as if falling from grace. The more one looks at Herrera's heterogeneous work, the more one has the sense of exploring a hypertextual space, a space of mind in the digital age. Although hand-crafted, his art recalls the imagery of a 3D digitally modeled space in which elements of differing orders and registers coexist and float. His collages and wall paintings suggest simple Photoshop techniques more than traditional collage, and his seamless world of fragments has a computer-generated look that recalls fluid morphing. It is as if, fearing a loss of bodily, and perhaps of humanity, Herrera has undertaken the Sisyphean and skeptical task of constantly pulling us back into the body, into tactility, into the real world, like his Pluto morphing into our space over and over again. 1. Jessica Morgan, "Arturo Herrera", Grand Street 17 (fall 1998): 229. 2. Hamza Walker, "Arturo Herrera: A Gentle Trauma," Renaissance Society at The University of Chicago Newsletter (January 1998): 6, 13. Carolyn Christov-Bakargiev is senior curator at P.S.1 Contemporary Art Center, Long Island City, New York.